The name may fool you: No turkeys are involved in the creation of this unique candy manufactured in Rome, New York. 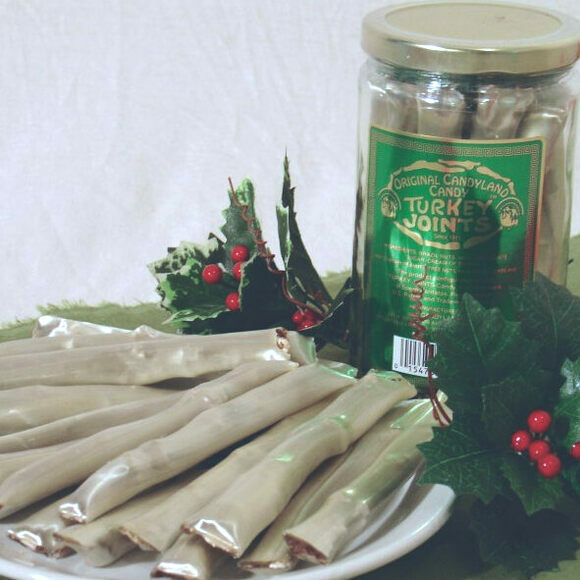 Turkey joints have been a Rome tradition for decades. Produced by Nora’s Candy Shop, these silvery, sugar-coated sticks have fans far and wide. With their sugary exterior, the sticks look eerily like bones, complete with a rich chocolate filling of “marrow” and bumpy “joints” of hazelnuts inside. Romans who have left the area routinely order jars to have a little taste of their hometown. Turkey joints are shipped only from October through May to ensure the fine outer shell remains as fresh as possible. In addition to the original variety, Nora’s also offers chocolate-coated, peanut butter, and dark chocolate cashew versions. Until recently, Nora's used Brazil nuts in their original turkey joints. Check the ingredients of your jar to confirm the kind of nut in your candy. If you can't make it to Rome, you can order turkey joints from Nora's or from Syracuse Crate. The home of turkey joints. A completely delicious, nearly nutrient-free sandwich beloved by generations of New Englanders.